The Borderlands project took place on two sides of the Colombian – Ecuadorian border. In Nariño we know about the hidden potential to produce high quality Arabica coffees. We’ve shared some of the stories from there previously on this blog. Less than 100 miles away, while the Andes mountains continue tracing the spine of South America, on the eastern side, directly to the south of Nariño, lies the Ecuadorian amazon plain, where we have been working on promoting the cultivation of robusta coffee. Borderlands has worked with 1,100 indigenous Kichwa families and 400 Colombian refugees in the zone to improve their cultivation practices. Mirroring the approach that we took in Nariño, we wanted to increase the farmers’ access to value added markets. We felt that robustas had the potential to be differentiated on quality and in order to demonstrate that, we helped create the first quality competition for robusta in Ecuador. Judges cup robusta at the Taza Dorada in Ecuador. Photo by CRS. During the 28th and 29th of July, in Lago Agrio, a small town in the Ecuadorian Amazon, the 1st “Taza Dorada” for robusta in Ecuador was held. CRS partnered with national and local actors – the National Association of Coffee Exporters (Anecafé) and the local government of Sucumbios to create an environment where robusta farmers could showcase the quality of their coffee. A total of 38 coffee samples participated in the competition, 30 samples came from small-scale producers and 8 samples came from large commercial plantations. 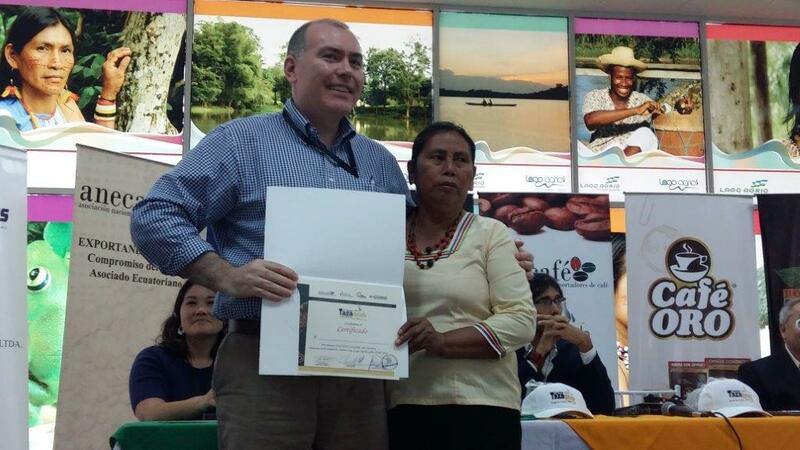 The jury was comprised of international recognized coffee experts, such as Andrew Hetzel, Dorothea Hescock and Miguel Meza, along with two national judges, who received their certification as R-Graders with the support of the Borderlands project. Calixto Rivera Narvaez was the winner of the competition. His coffee scored 84.40, and had notes of grape, caramel, jasmine, lemon, kiwi and banana. His farm is in the province of Sucumbios, and is found in close to the Colombian border at 800 meters. Miguel Meza, who represents Paradise Roasters, bought the winning lot at $2.25 a pound, close to 2.5x the commodity price. He was pleasantly surprised by all the aromas that are found in Ecuadorian robusta coffee. Coffees placing in the number two and three positions were purchased by Ecuadorian coffee company El Café C.A. at the premium prices of $1.40 and $1.30 per pound, 50-60% more than market rates. Lots #4-15 purchased by Solubles Instantáneous C.A., and were sold at $1.05 to $1.15. Lots #16-25 were also purchased by El Café C.A. at $1.00 per pound. Miguel Meza, one of the international Judges, had glowing reviews about the coffees he tasted. “I think consumers will be very surprised by the complexity of flavors and sweetness of these coffees. I will offer the winning coffee as a single origin offering and encourage customers to use both for espresso and filter coffee. In the future I would very much like to be able to feature further coffees as single origins as well as include some of these excellent Ecuadorean robustas in some of our espresso and filter blends”. Andrew emphasizes that “in coffee, really there are two ways to play the game: you can choose to get big or you can choose to get good, I think that Ecuador has the potential of being good, and that is a good way to bring value to the producers”. Andrew Hetzel, the head judge, recognizes the president of the indigenous women’s group Kallary. Photo by CRS. The first Taza Dorada for robusta is helping to build out a differentiated quality market for Ecuadorian robusta coffee that delivers higher prices for farmers. As climate change pushes arabica coffee to higher and higher altitudes, farmers left behind with now unsuitable lower elevation land have another diversification option – high quality robusta.